The luxury Palm Island Resort & Spa is a private island resort located near the southern tip of St. Vincent and the Grenadines, a chain of 32 islands and cays in the Caribbean. Highlights of the all-inclusive resort include five beaches, three hiking trails, a lagoon-style pool, and great diving and snorkeling opportunities. The resort has undergone a number of recent upgrades, including updated menus, new linens in the guest rooms, new sun loungers by the pool and beach, and an updated gym and spa. Seagrape Suites feature a covered furnished patio or balcony. 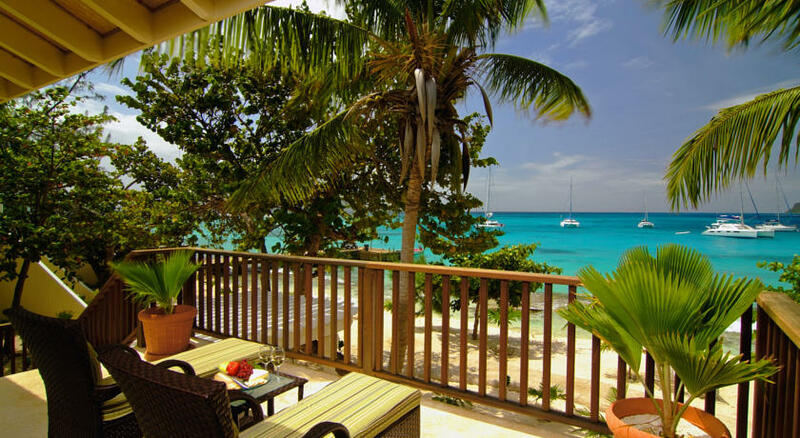 There are 43 rooms at Palm Island Resort, ranging from standard rooms to ocean view suites. More than half of the rooms are located directly on the beach, while the rest are located just a few steps away. Four impressive villas with private pools are also available. All accommodations feature custom bamboo furnishings, woven rattan ceilings, and stocked mini-fridges. Palm Island Resort offers daily afternoon tea, premium alcoholic beverages and three meals per day. Dining options include Sunset Grill, a casual beachfront restaurant serving lunch and dinner; and Royal Palm Restaurant for a more formal dining. Activities at Palm Island Resort include biking tours, kayaking and paddle boarding. Guests can explore nearby Tobago Cays and Mayreau onboard the resort’s catamaran for an additional fee. Note: Palm Island Resort & Spa is an adults-only resort for most of the year, although kids 12 and older are allowed during low season — typically late April through early January. Inter-island airfare is complimentary for guests staying seven nights or longer. Upon arrival in St. Lucia (UVF), guests take a 30-minute flight to Union Island on Grenadines Airlines. Guests are then taken to a private boat, which transfers them to the private island resort. Visit Palm Island Resort & Spa’s website for more information.